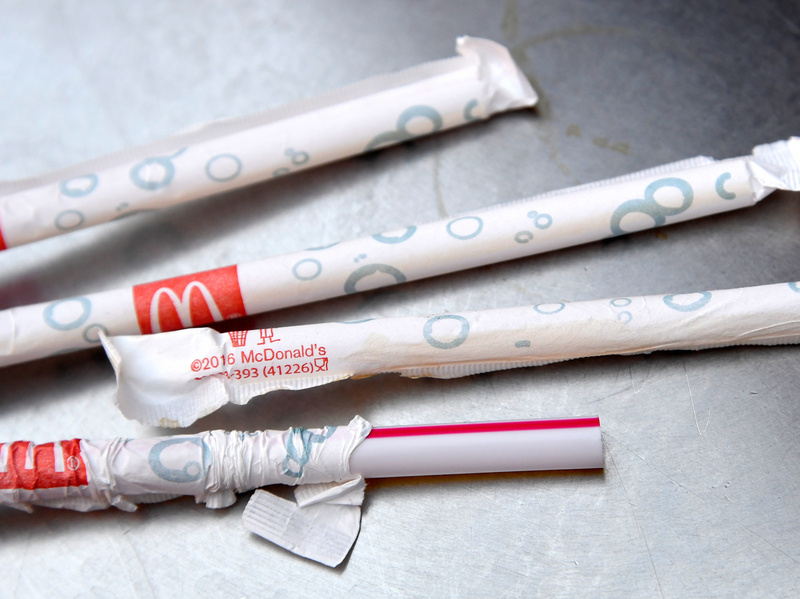 McDonald's Says It's Ditching Plastic Straws In U.K. And Ireland McDonald's also says it will test alternatives to plastic straws in some restaurants in the U.S. and several other countries later this year. McDonald's said Friday its restaurants across the U.K. and Ireland will start swapping out plastic straws for paper ones. "You asked, we listened," the chain announced on Facebook. The company says it will begin transitioning to paper straws at all of its locations in the U.K. and Ireland in September. A petition calling for the chain to stop using plastic straws has drawn nearly a half million signatures. The company reportedly uses about 1.8 million straws a day in the U.K., and it has committed to having 100 percent of its packaging come from "renewable, recycled, or certified" sources by 2025. Plastic straws are generally used only once, making them a prime target for environmentalists who point to the enormous amount of plastic that ends up in the world's oceans — the equivalent, according to one marine ecologist, of a garbage truck full of plastic every minute. "Reflecting the broader public debate, our customers told us they wanted to see a move on straws," McDonald's told the BBC. The company will begin phasing out the plastic straws and complete the process next year. By the end of 2019, all U.K. and Ireland locations will have facilities to recycle paper straws, The Guardian reports. The burger empire says it will try out alternatives to plastic straws later this year in the U.S., France, Sweden, Norway and Australia, but didn't specify what the straws would be made of. And in some markets, including Malaysia, it will experiment with a more radical approach: offering straws only upon request. Michael Gove, U.K. Secretary of State for Environment, Food and Rural Affairs, called the shift a "significant contribution to help our natural environment," USA Today reports. "We want more companies to say no to unnecessary single-use plastics." The McDonald's announcment comes amid a larger move against the straws in Britain, where in April Prime Minister Theresa May proposed banning plastic straws and other single-use plastic items. A number of U.K. businesses have already stopped using them. The movement to eliminate plastic straws is gaining momentum in the U.S., as well. Cities including Miami Beach and Malibu, Calif., have outlawed them, and a ban on plastic straws and utensils in Seattle comes into force next month. Food services company Bon Appétit said last month it was removing the straws from its 1,000 cafes in 33 states.